Is a coral-based planet possible? I don't know what those problems might be, and because of that, I don't know if a coral-based world is utterly impossible, or is entirely possible, or is possible only with certain changes to the design. That's what I want to know. Very Important Note: This question is primarily concerned with physics, not biology. For this question, assume that space-faring non-aquatic creatures visually identical to coral (since actual coral requires water - assume that requirement isn't a factor) are perfectly viable. I'm more concerned with things like size, mass, gravity, atmosphere, etc. Size/mass. I don't care about the size of planet. Bigger is better, but if making the planet smaller will make it possible, I'm fine with it. Depth of folds. A true hyperbolic surface is made up of folds and trenches. I would like those trenches to reach down as far as possible, to the core if they can, but as long as they are at least as deep as mountains are high (~29K feet), I'm good. Planet. I'm after a single coral the size of a planet, not a coral which grows and covers a planet. However, if this is impossible, I'm willing to go the later approach (planet-covering coral), as long as the coral ridges are high enough. Material. I don't need a literal coral. The world can be constructed out of anything natural (vs man-made). Actual coral would be ideal though, if possible. Occupants. Humans are ideal. I at least want this world habitable by humanoid creatures, meaning bipedal, and more or less the size of a human. Don't worry about biology. I just want to make sure the coral-world can support such beings in terms of gravity, atmospheric pressure, temperature, etc. As long as these factors are close to Earth, I'm good. Answers: Answers to this question should say whether a world with a hyperbolic surface (meaning coral-like) is possible in the realm of physics. If such a world is entirely impossible under any circumstances, the answer should explain why in general. If such a world is possible, or is possible only with major changes, the answer should note that, and if applicable, note which changes would be required, and why. Again, in general. I will ask other questions if I need to drill down on any specifics. A brief mention of any important differences between Earth and the coral-world, if applicable, would be appreciated (for example, there will be no rain, constant earthquakes, etc.). Answers should NOT get into the biology of the coral-planet, or the biology of the inhabitants of the planet. Answers should deal only with the physics of the world, and by extension the physics of inhabitants living on such a world (aka, make sure they aren't getting crushed by gravity or floating away into space). Question: Assuming that space-faring corals are viable, would a planet-sized one be viable, and if so, would human-like (with adjustments as necessary) life on that world also be viable? To have a world that is coral to the core, I would have to say no. Life had to take root on something in order to get started and evolve into coral. Coral needs to be kept wet and must be fairly close to the surface to get energy from the sun. Now to come close to answering the question I will have to speculate and describe how I would envision it. It is assumed due to the size, Europa and Enceladus surface at the bottom of their oceans is smooth, due to not being large enough for tectonic action occurring, and thus no volcanic activity. Problem I see, if you started with shallow world wide ocean, and as the coral stacked upon itself, making the trenches kilometers deep, where does the extra water to keep the coral covered come from? Unless the coral can originally extract energy from a source other than the sun, then eventually the coral would create atolls. Plus, life would evolve that would feed on this coral, such as parrotfish, and poop sand, covering much of the sea floor in it. You have to account for erosion and damage from natural disasters. Eventually, the coral that has been buried for a million years would just become a form of rock anyway. Okay, I'll throw my two cents into answering this question after thinking about it for a long while. A single coral planet? Probably not. Photo: Mary Lou Frost. Courtesy of Coral Reef Alliance. These coral polyps actually look a lot like sea anemones, and are usually only seen during the nighttime when they come out of their houses to feed on drifting organic matter and small plankton in the water column. Contrary to popular understanding, corals are truly animals, not plants, and they do need to consume organic matter to survive. They're famous for their symbiotic relationships with zooxanthellae which can provide them with simple sugars produced by photosynthesis, but nutrients and more complex molecules are obtained by heterotrophy of passing organisms. 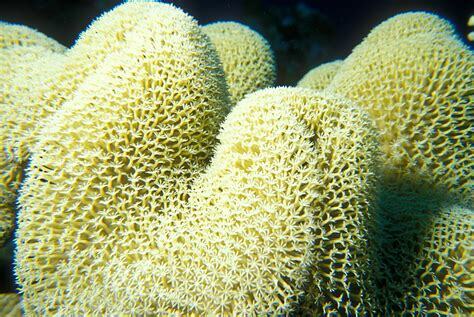 "Corals", the large-scale structures we're used to, are more accurately referred to as coral heads. These form because many of these organisms work together to secrete calcium carbonate skeletons. The structure left behind is composed almost entirely of crystalline calcium carbonate, better known as calcite. This is a problem for a coral-based planet because a single coral doesn't produce the kind of ridges and valleys you're looking for - it only secretes calcium carbonate behind it, leaving a kind of "cup" shape in which the coral lives. Okay, a "coral head" planet then - how about that? If you're okay with a planet made up of many coral polyps, as it seems like you are based on your provided image, things get a little more reasonable. There's a fuzzy line here, however, between a planet made up of many coral polyps and a planet that's simply covered in coral. There are two main challenges I see in a planet-sized coral head. The first is to do with formation, and the second is to do with maintenance and stability. What's required here is water. Coral polyps, at least as far as current biology goes, require water to survive. Removing a coral from the ocean for even a short period of time is usually fatal for the coral because it has no way of preventing water loss. Water keeps the coral polyp upright and sprightly because corals have a hydrostatic skeleton and rely on water pressure to keep them sturdy. Additionally, I don't know exactly how corals secrete calcium carbonate, but if it's in an ionic form rather than calcite nanospheres or something, then the water will be required to grow the calcite at all. The bigger problem here is mass conservation. Coral heads form after years and years of steady growth, in which mass is taken from the water around them and added to the coral skeleton itself. For a space coral to grow in the same way, it must obtain mass from somewhere. To stay true to modern coral science, it can't be just any mass either - it needs to be calcium, carbon, and oxygen (and probably some hydrogen). These elements, while quite common in most planets, aren't very volatile and are relatively uncommon in interstellar space. To have a coral "grow" and end up in the shape you're hoping for, you'd have to explain where those molecules are coming from. Finally, there's a proportionality between the size of the coral house (and thus the ridges formed) and the size of the coral itself. 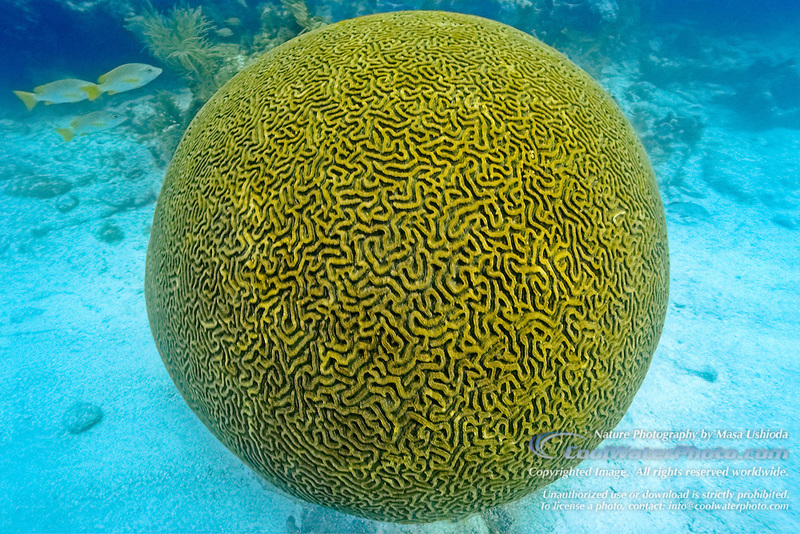 Brain coral polyps, as you use in the image above, are normally a millimeter or so in size, and they produce topography on the scale of centimeters. To get planet-scale topography with current biology, we'd expect moon-sized organisms. If you've got solutions to the above problems, awesome! Let's push on to talking about the stability of the recently-formed planet-sized coral head. What it seems like you're interested in here is the deep valleys and high ridges of a brain coral. This planet-sized coral, if not covered in water, will definitely be dead. The coral polyps will have long since rotted away, leaving behind their calcite skeletons. The fundamental constraint here on the heights of these ridges and valleys is therefore the compressive strength of calcite. Coral biologists, the meticulous people that they are, have of course measured the compressive strength of corals (paywalled journal article, sorry, but the important number is in the available abstract). They record the compressive strength as between 12 and 81 MPa (megaPascal), which is "lower than most other carbonate skeletal materials, but higher than that of carbonate engineering materials like concrete and limestone". I assume that the "other carbonate skeletal materials" include things like human bones, but I was impressed to learn that coral skeletons are apparently stronger than concrete. We can check the claim made here against third-party estimates of limestone and concrete and confirm that, in fact, coral's upper limit of 81 MPa is indeed higher than that of limestone (60 MPa) or "Portland Concrete, 28 days old" (35 MPa). Fortunately, this site also includes the compressive strength of granite, which allows us to do large-scale stability comparisons of a theoretical coral planet to our own, mainly granitic one - allowing us to avoid some very scary maths necessary to calculate it by hand. Granite has a compressive strength of 130 megapascals while coral maxes out at 81. Thus, naively assuming similar properties as a first-order approximation, we'd expect coral-based landforms to be about 62% as extreme as the ones we find on our own planet. With a particular famous mountain clocking in at 8,848m and a less-famous canyon measuring 5,800m deep at its deepest point, we can estimate that a coral-skeleton could cause a landscape with nearly 12 kilometers of relief. Sadly, this isn't nearly as much relief as we're hoping for. The image of the brain coral you use as an example of the topography you're looking for has a valley-peak height approximately 5% of the coral head diameter. With an Earth-sized planet, our 12km relief is barely 0.1% (12km / 12,000km). Darn. Note: I'm using Yarlung Tsangpo rather than the Marianas Trench for two reasons. One, the Marianas Trench is actively forming and not a stable system. Admittedly, Yarlung Tsangpo is also still being eroded, but not at the same rate. Two, the Marianas Trench can only get as deep as it does because it's braced by the water in it, and we're hoping for a water-free world here. However, don't give up hope just yet! Part of the joy of Worldbuilding is being able to tweak all kinds of constants. We can improve on our previous estimate by reducing the mass, and therefore the gravity, of our planet. Rather than using Earth as a model, let's look at a place like Mars. Mars is famous for having the largest mountain of any planet, nearly 22km tall by some estimates, and has some pretty darn big valleys as well, dropping to 8km below the "sea level". Mars' diameter is about half of Earth's, and the relief is nearly triple Earth's, so we've improved from 0.1% to maybe 0.5%, or one-tenth the relief we're hoping for. By pushing the mass of the planet even lower, we can get higher and higher relief and a lower radius. Mars' mass is about 10% of Earth's, so some back-of-the-envelope math suggests that reducing your planet to a mass about 0.5% of Earth's will produce the topography you're looking for. That puts your planet at about the same size as Pluto! (Whether this is still a planet or now a "dwarf" planet is not a debate I am interested in right now). Whew. Of course, I handwaved a lot in there, and reality would probably be even less favorable. Some additional factors that should be considered in a more rigorous calculation: the angle of repose for calcite (because the high and low points that I use aren't right next to each other, and the slope between the two should be considered); the compression of coral and its porosity with depth, as it metamorphoses into marble; the possibility of spinning the planet faster to mitigate some of the gravitational force; and the addition of a thicker atmosphere to help support the relief. Can I stop unbuilding now? Yay! How I'd imagine a coral-based world coming to be would be something like the following. A ball of water about the size of the Earth, supersaturated with carbonate ion forms, orbits a warm sun, keeping the planet tropical and friendly. At some point, a space coral spore finds it and begins living in the water. Over time, this coral reproduces and proliferates, and continues to grow in both size and number. As it grows, the calcite skeletons are jettisoned to the center of the planet, where calcite begins to build up and conglomerate. Over millenia, the corals cover the surface of the planet and all the calcite in the water is slowly used up. Over this same time period, the water is gradually lost to space , facilitated by the warm sun and the nearly-100% H2O atmosphere. Eventually, a crisis point is reached as the corals perish, leaving behind their beautiful homes and instead converting their remaining biomass into other space coral spores to be distributed on the solar wind. The planet is slowly freeze-dried as the sun continues to evaporate the last bits of water, minimizing water-mediated erosion of the surface. The resulting planet is about the size of Pluto composed of nearly pure calcite, with a topography dramatic enough to be seen from space. So throwing out the biological side... you'd need an appropriate sized world that is big enough to have 60-70k feet of elevation difference possible (30k everest, -35k marianas trench) without it splitting open. Additionally this world can't have any real tectonic activity, since that will cause lava flows and your lovely canyons will fill up. Of course, it probably had a LOT when it was being formed, which is how you got your start on the ridges and valleys. Next you need something to cause things to erode and dig those trenches and valleys. Natural wear - The Grand Canyon wasn't done with a garden spade... and it wasn't finished in a weekend. Water wear, wind wear, etc over millennia. Careful with tectonic activity - while plates slamming together can cause some nice big peaks, they can also let loose a bunch of lava/magma that tends to flow and fill in those valleys that took so long to erode out to a respectable depth. ET and co - a few hundred million years ago, ET and company came and strip mined a planet. One of their tools was a energy tool that simply vaporized away great swaths of the surface, with individual atoms being sucked out of the local area for sorting and storage. After stripping the planet ET and co. drop a Genesis bomb to seed the planet for life again, so they can come back in another 10000000000 years... they'll be here next Thursday. The tricky parts will be weather patterns, climate, and long distance travel. Coral all the way down is obviously impossible. 1) Maximum coral thickness: Coral isn't a particularly structural material and is porous by nature, so don't expect to be able to build mountains of it that are thousands of meters high as the underlying material would be crushed under its own weight. But in coral atolls - the surface coral is supported by a thick layer of dead underlying coral (that grew as sea-levels rose and/or local sea-floors subsided). I don't have an accurate vale but I imagine the maximum thickness of 'structural' coral would be no more than 100-200 m.
2) Corrugations and holes: The coral itself cant be deeply corrugated or filled with deep holes/caves due to its limited strength (as in 1 above). But if the underlying rock is corrugated and filled with caves, and the coral grew on all exposed surfaces, then you could have the 'illusion' of a fractal-surface made entirely of coral. But, on earth coral can only grow to a limited depth in water. In tropical 'reefs' it is typically found down to a few 10s of meters. Black coral grows down to a few hundred meters but it is a very different species and doesn't form continuous reef-like surfaces. Below 400-500 m it is completely dark and any 'coral' would have little semblance to the stuff we call coral on earth. The best you can do? : Maybe on a much smaller planet or moon that unexpectedly has a liquid water surface, the lower gravity would allow a more significant thickness of coral to grow (and the underlying rocky corrugations/caves could be much deeper due to reduced gravity. Cover all exposed surfaces with corals of various different species depending on water depth. Not the answer you're looking for? 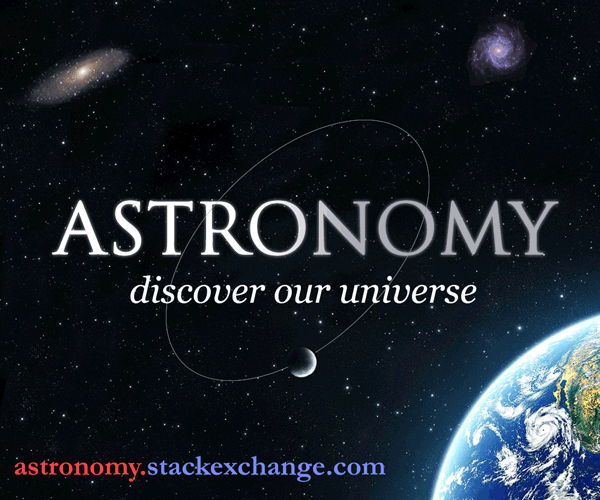 Browse other questions tagged science-based reality-check physics or ask your own question. Is a world with infinite resources possible? How do I prevent my turtle from collapsing under its own gravity? How fast must a planet with 1.27g spin to allow for space elevators? Would it be possible to make an inescapable planet? Can this ship exist within our current laws of physics? Is this coral lagoon geologically possible? How do I create the largest possible space habitat for humans?